Just sharing a quickie today. I had some lemon coconut curd leftover from last week’s cupcake recipe so I whipped up these tartlettes for a quick dessert one day and then shared the recipe on Instagram and Facebook. I’m sharing it again here, for those who may have missed it or prefer to have a printable recipe card. I hate wasting food, so I’m always finding ways to repurpose leftovers. In this case it was a no brainer. The Lemon Coconut Curd is so light, you could eat it with a spoon, all on it’s own or topped with fresh fruit and coconut. I thought it would be nice to have a crunchy element, so this almond crust was perfect. It’s made with ground almonds, dates, shredded coconut, lemon zest, vanilla and a few drops of coconut water and baked until crispy. Preheat oven to 180 C and line two mini tarlette pans with parchment paper that hangs out of the pan for easy removal of the crust later. Process all crust ingredients in a food processor, adding filtered water or coconut water as needed until a compact dough forms. Press dough with your fingers into two small parchment paper lined pans, pressing into the bottom and up the sides. Poke a few holes in the bottom of the dough with a fork, to prevent puffing while baking, and bake them for about 25 minutes, until golden brown. Be careful not to burn them, oven times may vary and they may cook more quickly in your oven, so watch them carefully. 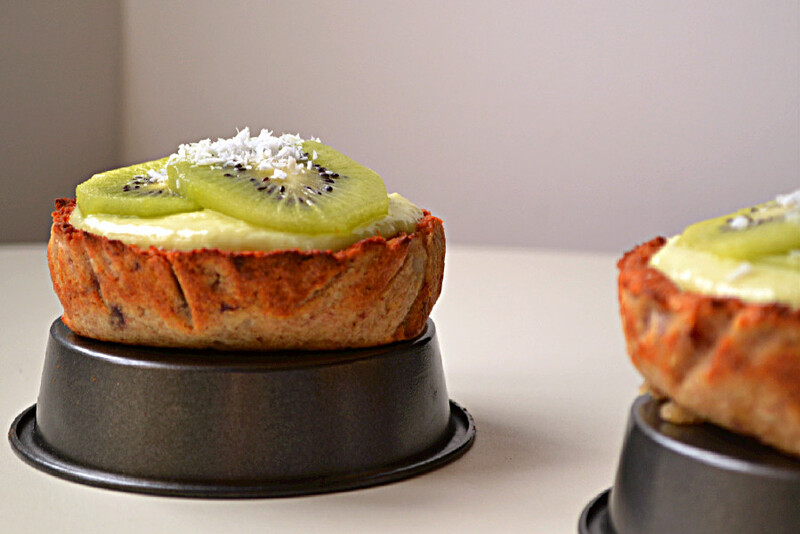 Once cooled, transfer to serving plates, fill will previously prepared lemon coconut curd, top with kiwi slices and shredded coconut, and serve. Note: These are best eaten on the same day. Leftovers can be stored in the refrigerator in an airtight container, but the crust will lose its crispness over time. Yes!!! I could have just licked the bowl clean it was so tasty light and fresh as it is, but then I got this idea and had a go at it and it turned out fabulous.